Exhibition Of Paintings By Deepak Sonar is an event that took place between 07-Feb-2007 and 21-Mar-2007 in Hyderabad. You can never grudge the success of a painter who does landscapes. There are 60 of them here, and we'll all love Deepak. Kalahita Art Foundation is presenting the works of Deepak Sonar in an exhibition of paintings titled Land Of Serenity, from 7th March. A selection of 60 landscape paintings is being showcased in this exhibition. 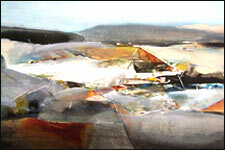 Deepak’s works bring to the shore, residues of emotions experienced throughout his travel within the Indian regions, with each place under the spell of its weather conditions, topography and vegetation, and therefore yielding to a magical range of hues and subtle use of textures in his paintings. The artist informs of his experiments in application of paint with a variety of tools available, to achieve a poignant expression. Places once seen and experienced are now depicted with a skilled use of color progression. While there is a presence of various shades of blue and green in the landscapes of the North-East, the lush green and bright yellow hues conjure Bengal. The parched lands of West to Central India are depicted by the use of earthy red color and tones graduating from brown to yellow. The blue and the grey palette defines the edge and the sea experienced in Bombay. The artist internalizes emotion and experiences of all kind. The occasional intervention of geometric forms originally used for an indication of a house or a mountain is now appropriated to achieve dimension and depth along with a subtle formal association. Deepak Sonar is born in Nasik, and lives in Pune. He received his education in art in A K Mahavidyalaya, Pune, and thereafter a Diploma in Art Education from Sir J J School of Art. The artist has been awarded by the Bombay Art Society with the G R Wadangekar Award in 2006, the Nasik Kala Niketan award in the years 1985 and 1987, and the State Award in the years 1987, 1991 and 2003. He has participated in exhibitions since 1993, and has received the Research Grant Scholarship from Lalit Kala Akademi in 1995 and the Junior Fellowship from the Ministry of Culture for the years 2000-2003. The exhibition will be inaugurated by the art lover Sunil C Reddy, and his wife Uma Reddy, at 6:00pm on 7th March. The paintings will be on view from till 21st March. For further details, please contact art gallery at 2335-0543. Be the first to comment on Exhibition Of Paintings By Deepak Sonar! Just use the simple form below. fullhyd.com has 700,000+ monthly visits. Tell Hyderabad what you feel about Exhibition Of Paintings By Deepak Sonar!